PUTINA PUNCO, Peru, Oct 1 2010 (IPS) - It’s Saturday and the women hurry in to the cooperative’s warehouse in this rural town in southeastern Peru with their huge bags of coffee beans on their backs. Some come on their own, others are accompanied by their husbands or children. But they have all hiked long distances from their farms in the mountains where they grow some of the world’s top organic specialty coffee. Victoria Viamonte, 43, and her 63-year-old neighbour Inocencia Chipana haul their 50-pound bags of beans from their farms, a three-hour walk away. For others, the burden is eased by a mule or a wheelbarrow. The small coffee growers’ farms are scattered along the hills in the jungles of Puno, a region in the southeast corner of Peru that is earning a name for the coffee of Sandia, one of the provinces in the region. Putina Punco, in the province of Sandia, is a 12-hour drive north of Puno, the capital of the region of the same name. In this area, Quechua and Aymara indigenous men and women produce, in harmony with nature, the beans that won an award this year as one of the world’s best specialty coffees. In April, the Specialty Coffee Association of America (SCAA) selected the Tunki beans grown by Wilson Sucaticona, a young Aymara farmer from Putina Punco, as one of the nine best “Coffees of the Year”, at the 2010 Roasters Guild Coffees of the Year Competition. His beans also won the People’s Choice Award. Shortly afterwards, the Specialty Coffee Association of Europe (SCAE) selected Tunki coffee, which is grown in Tunkimayo, in Sandia province, to participate in a London fair of the world’s best coffees. The price of Tunki coffee immediately shot up to its highest level yet, 1,000 dollars per quintal (100 pounds). Saturday is market day, and the small coffee farmers have come down from the hills to buy the week’s provisions and deliver their beans. The warehouse of CECOVASA — the organisation of coffee-growers cooperatives of the Sandia Valleys — has become a busy beehive of activity, full of perspiring men and women hurrying to get everything done. “Women and men work on an equal footing in the countryside,” Teresa Jove, 45, secretary of the CECOVASA women’s development committee, tells TerraViva. “We back each other up, and support our family together,” says her husband, Pastor Larico, 51, before adding how proud they are that their three children are studying at university. CECOVASA, the country’s second-largest small-producer organisation, sells 97 percent of its beans to the United States and Europe. The organisation’s sales started to take off in 1998, when its growers began to produce organic shade coffee with the support of the U.S.-based Conservation International, which is promoting sustainable practices among coffee farmers in Peru’s Upper Tambopata valley to the north of Lake Titicaca, to keep them from encroaching on the Bahuaja-Sonene National Park, part of which lies in the region of Puno. 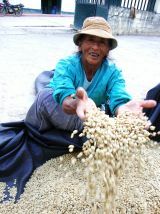 The quality of the beans improved as the farmers adopted measures ensuring sustainable production of fair trade coffee. And to help obtain international certification of the coffee, CECOVASA began to promote gender equality as well. As a result, 30 percent of the 5,000 cooperative members are now women. But machismo runs deep. “There are farmers who haven’t gotten used to a woman saying what she thinks and speaking out,” says Rocío Vinueza, a Catholic nun who works with the women coffee-growers. María Ramos, 56, is one of the women farmers who has come out of her shell. She previously headed CECOVASA’s women’s development committee, of which she is now vice president. Her farm is located 1,650 metres above sea level, like Sucaticona’s award-winning coffee bushes. At this altitude, harvest season lasts from May to September, because the beans ripen slowly due to the cool, humid mountain air. But Ramos has been used to hard work since the age of seven, when her father taught her to pick coffee beans, after the family moved from the cold altiplano of Puno. She has spent more than three decades producing coffee without artificial fertilisers, and has won two regional awards. And in December, her beans were among the winners of the Cupping for Quality competition featuring Rainforest Alliance-certified coffees, in which she competed with producers from Brazil, Indonesia, Kenya, Tanzania, Uganda, Zambia and the U.S. state of Hawaii, as well as with other farmers from Peru. On the upper slopes of the Tambopata and Inambari valleys in Sandia province, coffee growers are facing the expansion of coca crops. In Tambopata, where Ramos has her farm, coca fields are increasingly hemming in the coffee farms, while in Inambari they have won the battle. “They say it’s easier to grow coca leaves (the raw material of cocaine) and that you earn more, but I’m loyal to coffee,” Ramos told TerraViva one night in her humble, spotless home, where she raised four children on her own after separating from her abusive husband 20 years ago. Ramos complains that the 85 dollars per quintal that CECOVASA pays in advance of delivery is not enough. Altogether, the coffee farmers receive an average of 107 dollars per quintal, except in the case of award-winning beans like Tunki coffee, which can fetch up to 1,000 dollars per quintal. On her two-hectare farm, Ramos produces some 40 quintals a year. The local farmers are all small-scale, producing a maximum of 80 quintals a year. The life of a coffee farmer is not easy. Ramos gets up at 4:00 AM to make the breakfast and lunch that she takes to the fields for herself and her hired hands. Chewing coca leaves for energy, she starts to weed, pick and wash the beans, and remove the outer skin and fruit. She doesn’t get to bed until 10:00 PM, and every day is basically the same, unless it rains or there is a full moon — because of a local belief that crops will dry up if you work in the fields during that part of the lunar cycle. Ramos, like other coffee farmers in the area, followed the advice she was given to plant timber-yielding trees on her farm to reforest damaged land and provide shade for the coffee bushes. The fertiliser she uses comes from kitchen vegetable waste, the outer fruit of the coffee beans, and the feces of the guinea pigs she raises. She uses no chemical products. Everything on the farm is recycled, everything is neat and orderly, and just about everything is green, except the ripe coffee beans, which are bright red. “We have to care for the environment, for the sake of everyone’s lives,” Ramos says with conviction. “When a woman participates and gets involved, she grows in courage, and is no longer afraid,” she says, recalling what she felt when she went to receive a prize in late 2009. Although everyone was speaking in Spanish, she decided to speak in Quechua, her mother tongue, “because I felt more confident that way, and everyone applauded,” she says with a smile, surrounded by her sacks of coffee, three of her children, and several grandchildren. *This story was originally published by IPS TerraViva with the support of UNIFEM and the Dutch MDG3 Fund.